Players start in a 2 guard front set, the 4 and 5 set themselves just outside the key area. 1 passes to 3 opening up the zone. 3 passes back to 1 initiating rotation. 3 cuts though the base receiving screens from 4 and 5. 1 swings the ball to 2. After setting the screen 4 flashes to the free throw line waiting for the pass from 2. 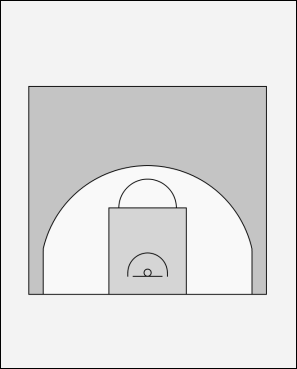 2 has the option of passing to 3 in the short corner or 4 at the high post. 4 and 5 can play a high low game if there is no shot from the corner. 3 passes back to 2. 4 returns back to low post. 3 cuts through the base using the screens set by 5 and 4. 5 flashes high looking for the open jumper.